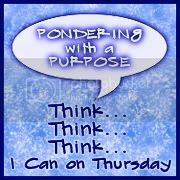 This week's topic for Brenda Youngerman's Pondering with a Purpose is Love Thyself: Do you love yourself? This is a question in which the answer changes not only day by day, but hour by hour. And it can change with the flip of a switch, for any reason or for no reason. I want to love myself. Honestly, I do. I know that there are so many good things about myself (as I talked about in my day 6 challenge). I know that I have a big heart. That I love my family and my friends and that I'll do anything for them. I know that I can and will offer support to those in need, and I'll hug anyone given half a chance. I know that I'm worthy of love and that I have enough people that love me to prove it. I'm an amazing person, someone with depth and strength that I sometimes to recognize myself. I deserve love, not only from those that know me well, but more importantly from myself. The problem is the many years of self doubt, depression, and bad choices. Most of my life, I've had problems with my own self-worth. Teased through school because of my weight, my brain and my lack of money, it was hard for me to see anything worth loving. After all, when you hear one boy tell another "Oh no, Amber's got a crush on you! You better run now!" you start to think that there's something wrong with you. So it is difficult to remind myself that a) youth is callow and cruel and b) their opinions really shouldn't have mattered. The hardest thing for me to fight, in my need for self-worth, is the depression. I'm getting better, thanks to my meds, but there are still days when I find myself berating myself because of something left undone. Today, as I was driving to and from my physical therapy appointment, I found myself thinking negatively. "Look at you. You got such a great start on your daily challenges and your SparkPeople exercising, and now you've gone two days without typing anything. You know that you're going to go home and just play on Facebook. That's what you do. You'll go home and sit in front of the computer getting nothing done, or you'll go upstairs and nap. That's all that you can ever seem to do. You don't follow through with anything. You know that, right? So why did you think this would be any different?" This voice comes out at the oddest times, like today, sapping my mood and sapping my self-love. It's taking me time to push past it. Today, I realized that I was being self-defeating. I realized that I was pushing myself toward the negativity. And I had to remind myself that yes, I'd put things off for a few days. But there was still a majority of the day left. Yes, I've got to pick up Pete from PDO at 2, but I can get more things done afterwards. There's always tomorrow, and there's always after Pete and I get home. There's still time and it will get done. So right now, I love myself but my depression doesn't. We're in a war for control but I'm confident that, eventually, I will win. Because I am stronger than my depression. I wouldn't have been on this earth for almost 39 years if I weren't.